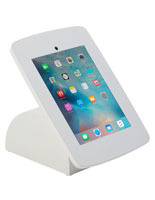 Need an Apple® device enclosure that sits on a counter, table or desk? 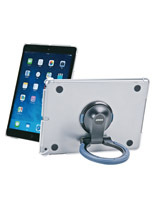 These iPad Air holders are made for hands-free use and can be used in retail, office and residential settings. 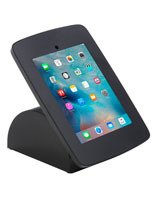 This type of case can be used in stores for displaying digital catalogs, animated advertisements and slideshows that showcase merchandise. 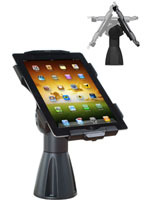 Additionally, they can be used more directly as a digital register or POS kiosk. 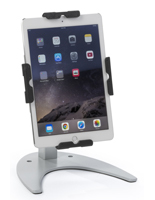 In an office, these iPad Air holders make great workstations or second screens for employees with a computer. 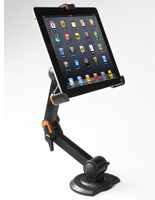 They can also be used in homes for easy hands-free touchscreen use. 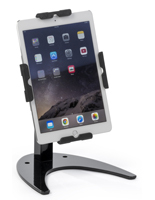 iPad Air holders, also known as countertop tablet stands, come in an assortment of styles to accommodate each of these applications. What features are available with these touchscreen displays? 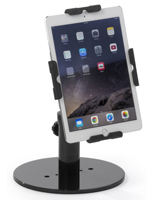 iPad Air holders with a flexible enclosure can support more than just the latest Apple® devices. 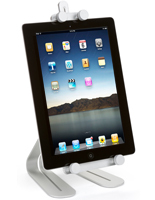 They can also accommodate generations 1, 2 3, 4 as well as 10” Android models. 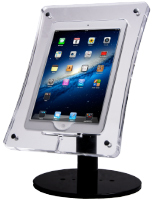 These POS enclosures have an open stand design or gripping arms that are compatible with a number of electronics. 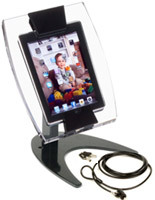 Adjustable cases are excellent for accommodating different display options. 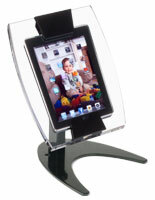 Rotating brackets allow devices to showcase apps, pictures and videos in an either portrait or landscape orientation. In addition, tilting fixtures can be adjusted to face users of any stature and can be placed on countertops of any height. 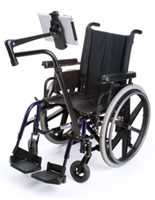 For extra maneuverability, some models feature a flexible arm with adjustable height that makes them great . 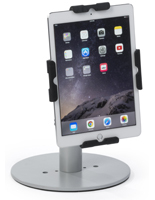 For public environments, holders can include a locking mechanism that prevents theft and tampering. 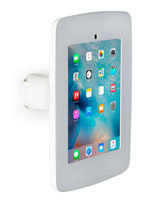 This type of bracket either features a lock directly in the frame or an external Kensington security kit that needs to be tied to an immobile fixture. 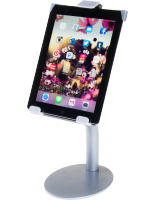 Each of the secure POS and register stands has a strong steel or aluminum construction to prevent break-ins. 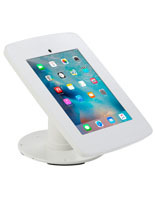 Some holders offer addition security with a design that affixes directly to countertops. They can screw directly to surfaces to further prevent theft. 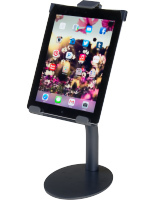 With their tilting design, they can also be mounted to walls to save on tabletop space. Each case comes with the option to display or conceal the home button. Controlling this feature allows storeowners to prevent customers from navigating to unauthorized apps. Kiosks like these may also feature an adjustable cover that allows users to choose between showing and hiding the home button. 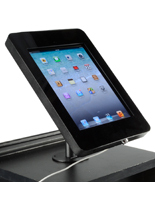 Kiosks with a portable design are ideal for easy transport and storage. 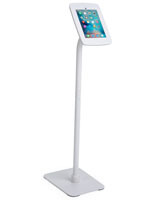 Some units have a ring shaped easel that can fold into the frame or act as a carrying handle. 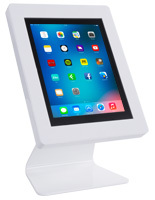 These countertop tablet displays are all made of strong steel, aluminum or plastic. 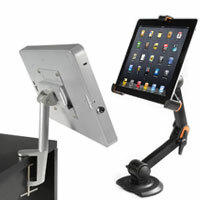 Each features a modern black, silver that makes them attractive POS accessories. 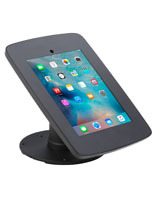 For retail stores that want to use these brackets as registers, their slim profile can sit on any desktop while occupying as little space as possible. 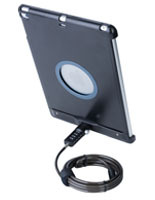 In addition, some units offer open access to the audio port for accessories like the Square Card reader. 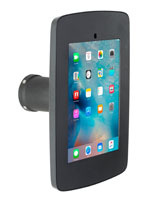 For office and residential environments, this allows users to insert headphones into the touchscreen while it’s encased in the mount.